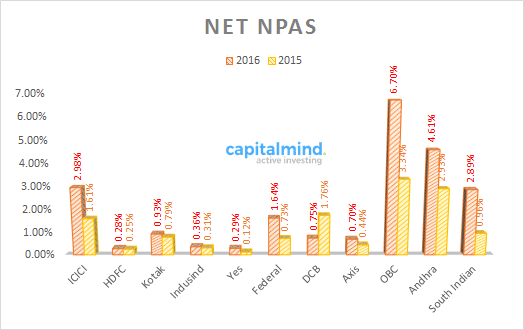 A quick look at Banking results shows us a major deterioration in NPAs – both Gross and Net. Gross NPAs = the loans that are 3 months (or more) delayed in principal or interest, as a percentage of all loans. 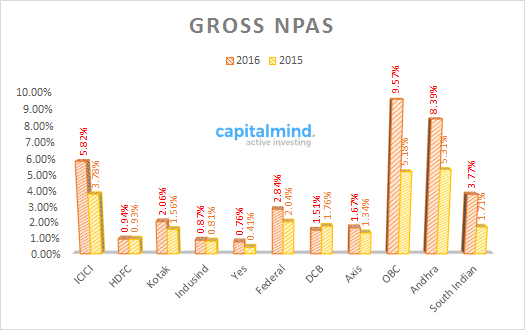 Net NPAs = Gross NPAs minus provisions, as a percentage of all loans (minus the loans already provisioned for). While calculating Net NPAs the banks can reduce any amount already collected (like if they had shares as collateral, how much ever they recovered from that etc). Technically if banks provided fully for all loans there would be no Net NPA. But because banks leave loans in Limbo, they have Net NPAs. ICICI bank has a very high number compared to other private banks. But it has, at the very least started stringent provisioning. HDFC, Indusind and Yes Bank seem to have negligible NPAs. Kotak and Axis are only marginally higher. We are seeing a general rising trend in NPAs, which seem to be much higher than 2015. This applies to both Gross and Net NPAs. The rise in Net NPAs means banks aren’t provisioning enough. Nearly all banks that show higher profitability seem to have done it on the back of sub-optimal provisioning. A rank outperformer is DCB which has reduced both net and gross NPAs. Even though it’s had no real profit growth, the asset quality change makes it stand out. As more banks come up with results, the chart will get crowded, but we’ll know how crazy this situation gets. 2016 is going to be bad – we just don’t know how bad.